Have a Heart Day is a child and youth-led reconciliation campaign to help that ensure First Nations children get a fair chance to grow up safely at home, get a good education, be healthy, and feel proud of who they are. 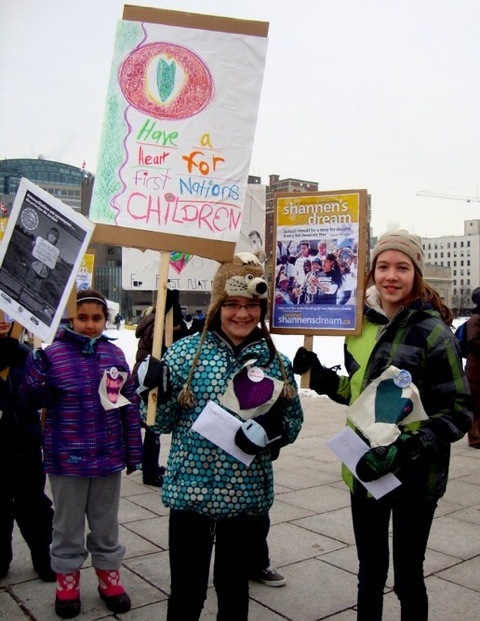 Each year, schools from Ottawa, Gatineau and beyond gather on Parliament Hill to read letters and poems, sing songs, and stand together for love and fairness. Due to the severe winter storm expected Tuesday and Wednesday of this week, we have made the very difficult decision to cancel Have a Heart Day on Parliament Hill. While the weather may clear up by Thursday, there is no guarantee that Parliament Hill will be cleared of snow in time for the event and conditions may not be safe, especially for younger students. We encourage people to continue to celebrate Have a Heart Day in their classrooms, places of work and homes. Thank you for standing with First Nations young people to make sure they have the chance to grow up with their families and communities, get a good education, be healthy, and proud of who they are!